The second stage of the MKM Series 2016 is held in Frankfurt, Germany! Check out the flyer for schedule and other dates in 2016! The pre- registration for the MKM Series 2016 Frankfurt, Germany is up and running! You can even pre-register your complete group of friends! You can purchase your ticket in advance for each main event (Modern, Legacy, Standard, Vintage). You might notice that the registration fee is just 15€ instead of the usual 30€ for an MKM Series Main Event. A 15€ fee for entering the collectors' fair is charged by entrance. To avoid raising the costs for you players we decided to offer the main events in Frankfurt at a discount rate of 15€ (instead of 30€). All in all the fee stays the same, but is split in two separate parts. Hope you understand, appreciate and take part! Love to welcome you in Frankfurt! Top8 decklists, metagame, player profiles feature matches and more! Ticket pre-sale works out fine! Too fine maybe ... ? 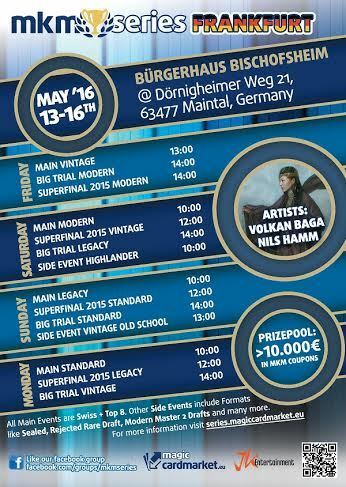 Via the MKM website you can order tickets for the 4 main events of the MKMS Frankfurt stage. You get a guaranteed seat in the respective tournament as well as the exclusive Monk token card. Currently we offer pre-sale exclusively for the main Events, not for Side events and obviously not for the Superfinals 2015, which the invitees enter for free (but eligible for participating are only the top 32 of the 2015 leaderboard btw). We will evaluate if for future stages we also offer a pre-sale for selected Side Events as well - but that's a different story. Back to topic: Pre-sale is running smoothly. So smooth that we reached the original cap of the pre-sale tickets for two events already. There are another few weeks until the #mkmsfrankfurt and we expect many more players starting to look for tickets in the 'hot' period prior the MKMS stage Frankfurt. But we want to keep a sufficient contingent of on-site tickets available to allow spontaneous players or fellow passengers to enjoy our event as well! We will keep having a close eye on the development of pre-sales in the next weeks. For now we have decided to increase the online tickets for the two most sought after Main Events: Legacy and Modern! Don't miss out on them!